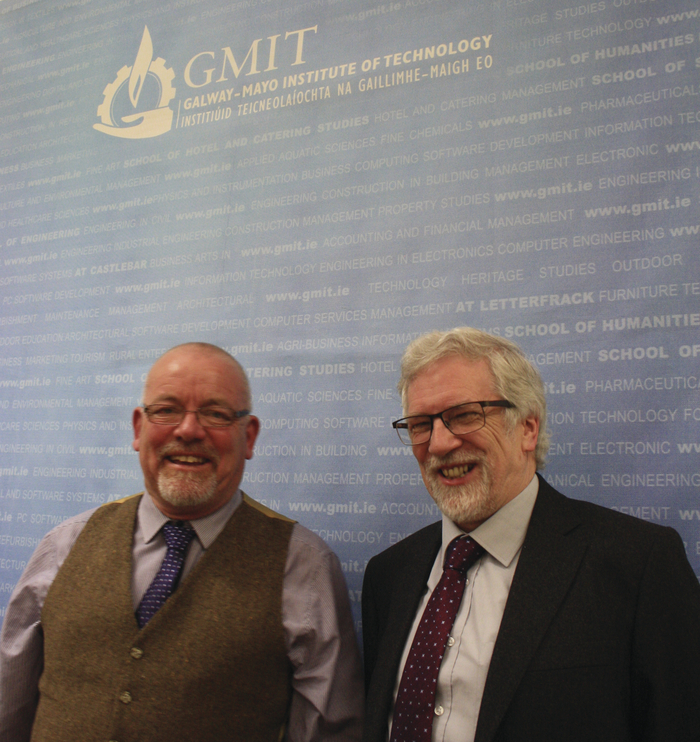 Historians Fergus Whelan and Terry Moylan at last weekend's Mayo Day events in GMIT. The multi-purpose Galway-Mayo Institute of Technology’s Castlebar campus staged the energetic opening ceremony of Mayo Day 2017 last Friday evening. The bank holiday weekend events were long billed to be a celebration of Mayo - past, present and future - and with no little amount of imagination and obvious hard graft, the organisers over-performed in achieving their aim. In his Mayo Day promotional video, director Lorcan Hynes beautifully wove an emotional message around the cliffs of Mayo and the skyscrapers of the world. The message invited the Mayo diaspora to return to a future Mayo, where prosperity will once again create opportunity. Our diaspora was to the fore during Mayo Day and for good reason as Peter Hynes, Mayo County Council’s chief executive, informed the opening ceremony that the global dispersion with Mayo heritage stands at 3.5 million people. Their affinity with their home county has led to Mayo associations growing up in the world’s biggest cities. Just as Mayo currently fits into current global themes of emigration and identity, so it did in the past when the international themes were revolution and republicanism. Those earlier themes, and in particular the political relationship they spawned between Ireland and France, were discussed at the fascinating Mayo Day La L’Arbre de la Liberté - Liberty Tree Conference on Friday and Saturday. The two-day conference offered an impressive line-up of historians and authors. The conference began with a lecture exploring the European spirit of revolution through the shared medium of song. Terry Moylan, a musician with an immense knowledge of traditional music and dance and the archivist at Na Píobairí Uilleann, a society set up to encourage the playing of the uilleann pipes, gave a multi-media presentation to a participating audience. The folk songs that emerged from the French Revolution (1789-99 ) were adopted and often adapted by insurgents in Ireland who knew, as Moylan explained, that by means of songs the passions of the multitudes would be very much raised. The airs of propaganda were spread by the United Irishmen in easily disseminated pamphlets such as Paddy’s Resource, a songbook of patriotic songs that were influenced by the successes of the French Revolution and by the arrival of our fraternal Gallic saviours to Mayo’s shores in 1798. Leading United Irishman Theobald Wolfe Tone even contributed a song to an edition of Paddy’s Resource. The airs of the rebel songs sung by the croppies in Kilcummin, Killala and Castlebar were also heard in Scotland’s Stuart tradition. Moylan concluded that the European tradition of sharing songs and music remains healthy and very much alive. Author and historian Fergus Whelan’s lecture ‘The Hidden Origins of Irish Republicanism’ detailed the beginnings of the United Irishmen that grew out of secret societies that were already in existence throughout Ireland, including Mayo. Whelan described how the Irish rebellion of 1798 was not an isolated phenomenon but rather was part of a contemporary global resurgence in modern republicanism. Interestingly, Whelan believes that Irish republicanism has its roots in the English version as brought to this island by Oliver Cromwell in the 17th century. Day two of the conference heard talks on General Humbert’s 1798 campaign, the common origins of Irish and French republicanism, and the penultimate contributor at the conference was GMIT Mayo lecturer Dr Fiona White, whose talk ‘John Moore of Moore Hall, Reluctant Patriot’ drew a large crowd and was followed by a bus tour of French Hill and Moore Hall. It was evident from the conference’s speakers that Mayo has never been an isolated entity and that we have used that experience to our gain. Our past, present and future share challenges to which we adapt and overcome. We have fought, we lead, we will endure.